Monday night the HBO documentary “One Nation Under Stress” aired, and one could only wish that it had received the same attention that Elizabeth Holmes’s incongruous baritone received when the Theranos documentary “The Inventor” dropped a week ago. The film was presented as a mystery that physician Sanjay Gupta, a cheerful detective who takes us on a tour of a dystopian hellscape of morgues, disintegrating factories and grey snow-swept forests, sets about to solve: why has America’s life expectancy declined for three straight years, the largest decline since 1915-1918, a time of war and pandemic? The most obvious answer was premature death due to alcoholism, opioid addiction and suicide, the triad knowns as “deaths of despair,” but why are so many people despairing? The answer, the villain that is making so many despair is given away in the title of the documentary–imagine Hitchcock calling his masterpiece Norman the Psycho–is stress, relentless stress that the brain can’t handle. With repeated exposure to stress, the most evolved part of the brain, the prefrontal cortex, begins to wither leading to poor decisions, while the reptilian brain, the amygdala, becomes stronger. Rage rooms thrive on the reptilian brain, but expressing anger by smashing Grandpa’s mug to pieces with a baseball bat does more to feed the reptile than quell the urge to destroy. Community can act as a buffer for stress, but social ties are unraveling just when we need them most, the connection gap filled with social media, a poor substitute for real human contact that adds to despair with depictions of lifestyles that for many are unattainable. The documentary offers some promising remedies such as exercise, meditation and baboons who would rather groom other baboons than fight. But Angela Glass, a nurse from Victoria Texas who became addicted to opioids that turned her into a fragile, hollowed-out shell and drove her to contemplate suicide, is the documentary’s hero of transformation who slays the dragon of stress. We see Angela enter rehab, sobbing and uncertain of recovery and emerge a year later, a new woman, her face rounded out, her hair shiny, her smile gleaming. It’s a remarkable metamorphosis. In an interview supporting the film, Dr Gupta was asked for one thing everyone can do to help alleviate stress. His answer, based on the idea that a huge part of stress is our sense that we lack control over what’s happening in our lives, is for each of us to say, “this is my time today.” This is my time, five, ten, fifteen minutes to do something just for me and my brain, to strengthen what stress has weakened. 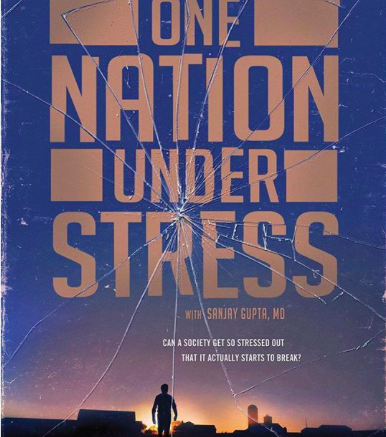 Perhaps One Nation Under Stress can become One Nation Taking Ten Deep Breaths. Lynne Everatt is on a mission to improve mental, physical and emotional wellness in the workplace, one small win at a time. A 2018 LinkedIn Top Voice in Management and Workplace, Lynne is a recovering MBA and nominee for the Stephen Leacock Medal for Humour for her first book, EMails from the Edge, a novel with the theme of workplace mental health. An ardent advocate for mental health through physical fitness, she’s a certified personal trainer who has completed two half-marathons and a marathon six minutes and twenty-three seconds of stand-up at the Absolute Comedy Club. She wants to bring a healthy dose of good humour to writing about wellbeing.